Fate: Sold for Scrap in 21 JAN 1947 to Patapsco Scrap Co., Bethlehem, PA for the amount of $67,228. 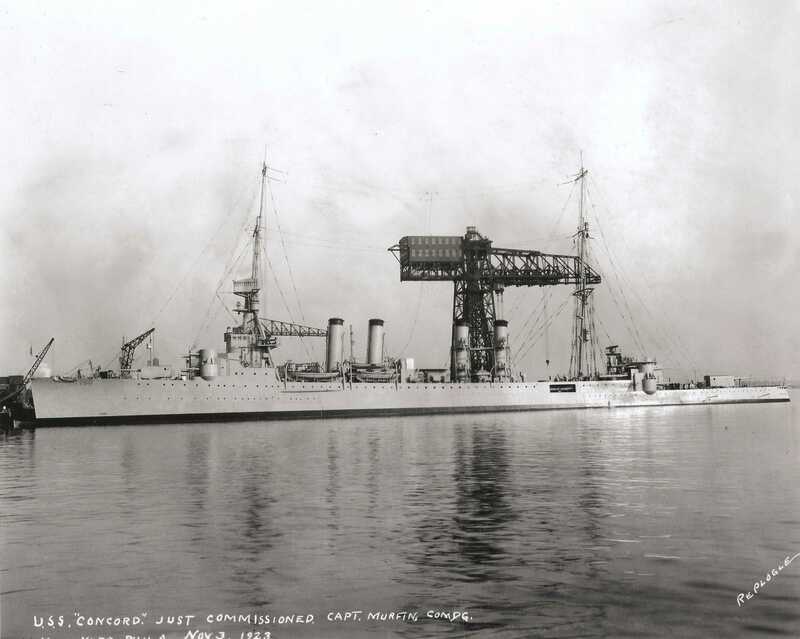 0401020 399k The newly commissioned USS Concord (CL 10) sits moored at the Philadelphia Naval Shipyard on 3 November 1923. 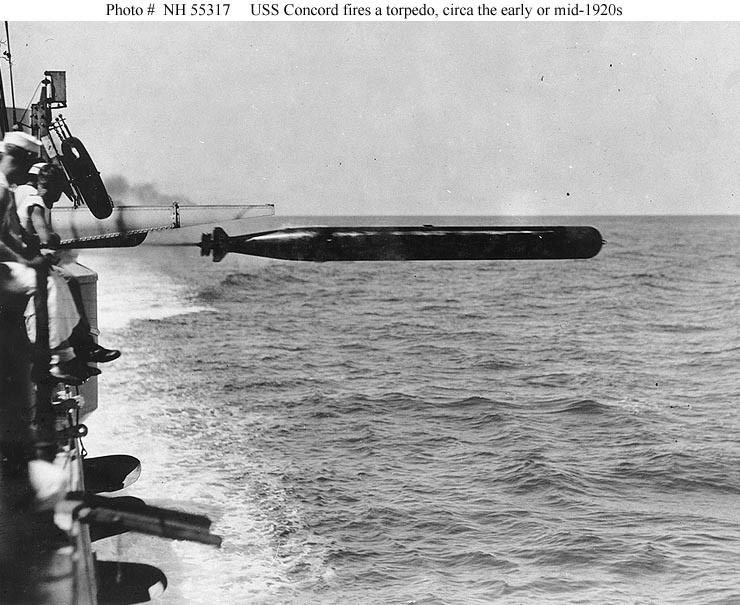 USS Concord (CL 10) firing a torpedo from her port side upper torpedo tubes, circa the early or middle 1920s. U.S. Naval Historical Center Photograph #NH 55317. 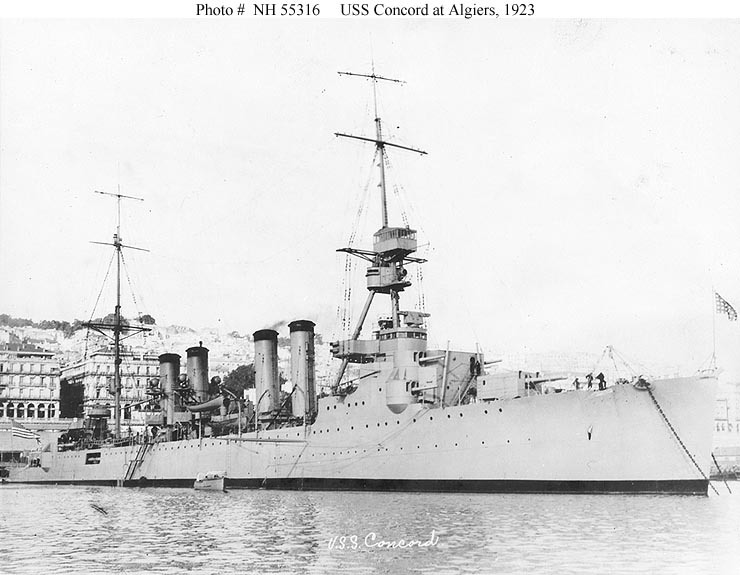 USS Concord (CL 10) anchored at Algiers, Algeria, circa late 1923. U.S. Naval Historical Center Photograph #NH 55316. 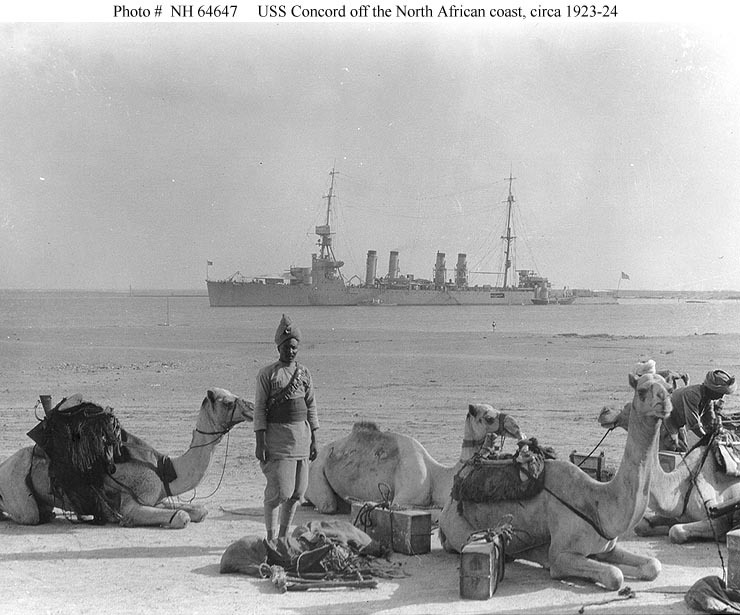 USS Concord (CL 10) at the edge of the desert off the North African coast, with local camel troops in the foreground, circa late 1923 or early 1924. During her maiden cruise at that time Concord steamed through the Mediterranean Sea and returned to the United States by way of the Suez Canal and the Cape of Good Hope. Donation of Franklin Moran, 1967. U.S. Naval Historical Center Photograph #NH 64647. 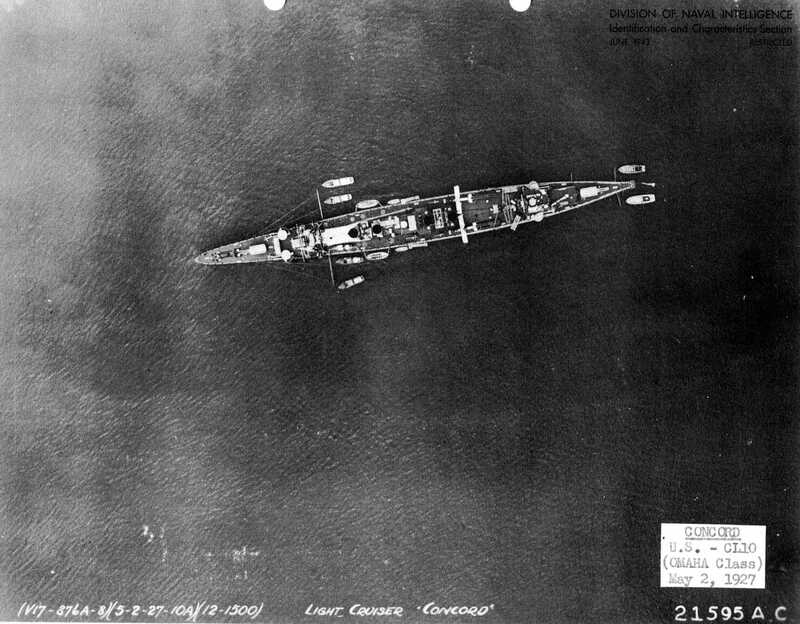 Overhead aerial view taken 2 May 1927, location unknown. USS Concord (CL 10) In a harbor, circa 1935. Note that she still has twelve six-inch guns. U.S. Naval Historical Center Photograph #NH 63530. 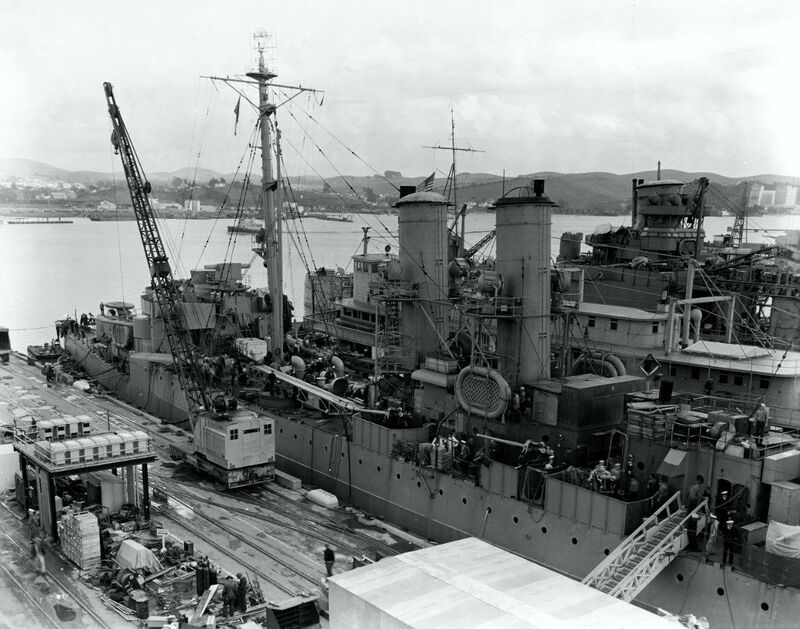 USS Concord (CL 10) at the Mare Island Navy Yard, 7 February 1942. 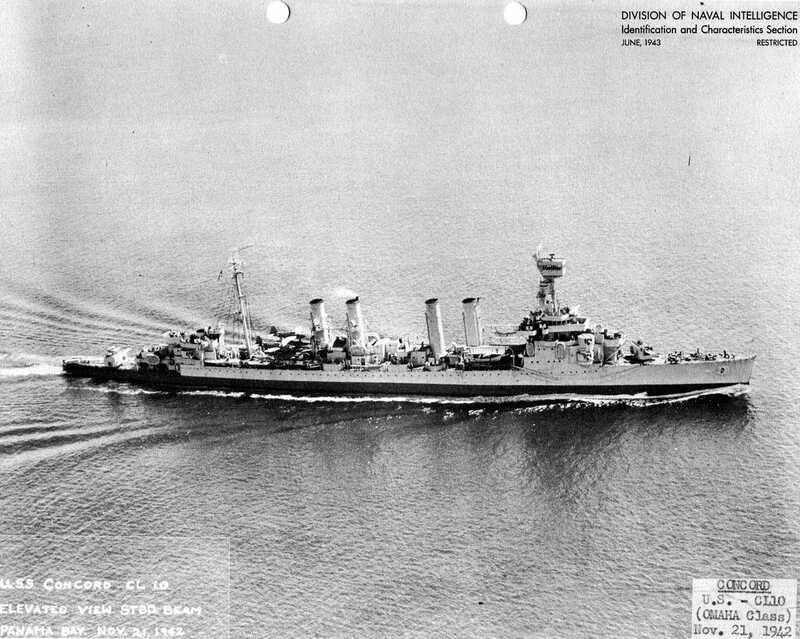 Port bow view of USS Concord (CL 10) off the Mare Island Navy Yard, 9 February 1942. 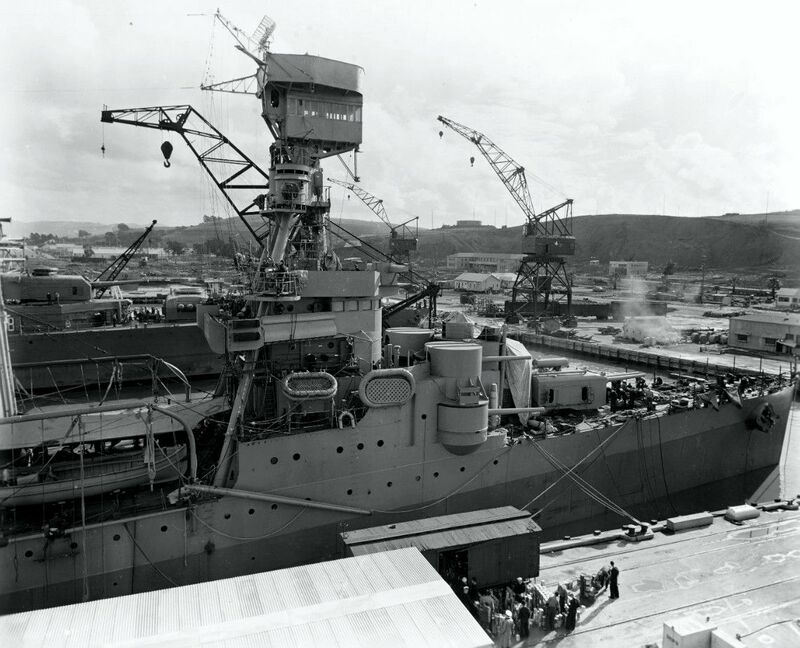 Port quarter view of USS Concord (CL 10) off the Mare Island Navy Yard, 9 February 1942. 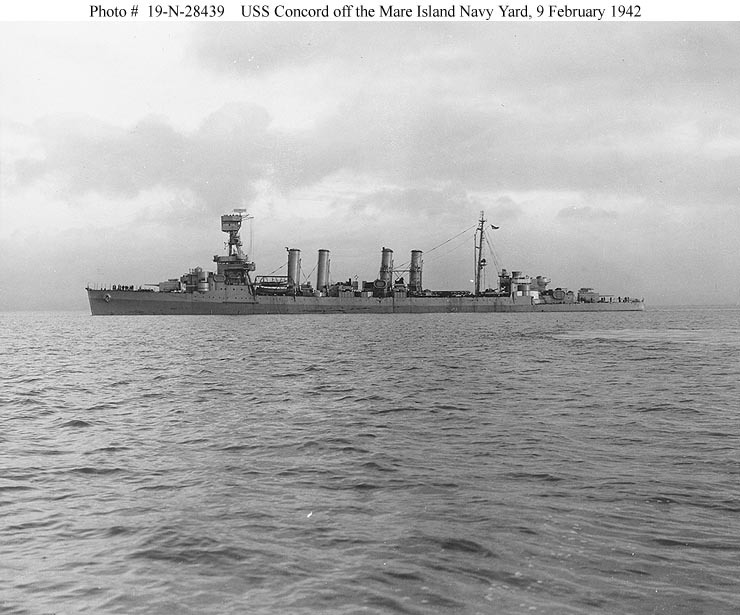 USS Concord (CL 10) Off the Mare Island Navy Yard, California, 9 February 1942. 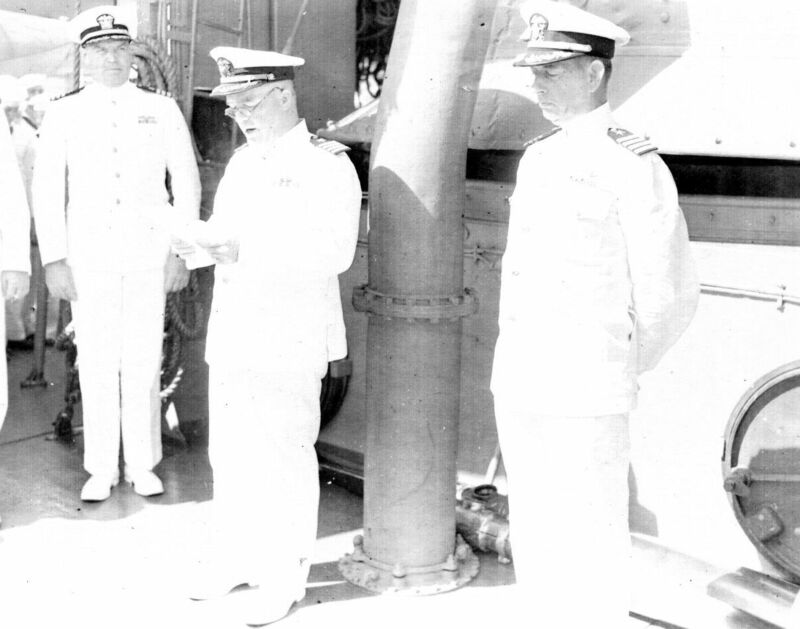 Photograph from the Bureau of Ships Collection in the U.S. National Archives #19-N-28439. 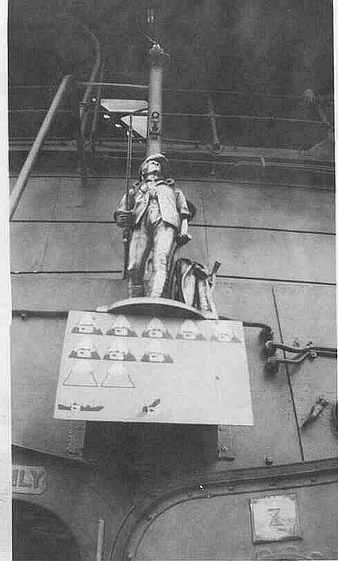 Labeled on the back...Hayne Elliot 3" Gun Crew - he became a Rear Admiral. 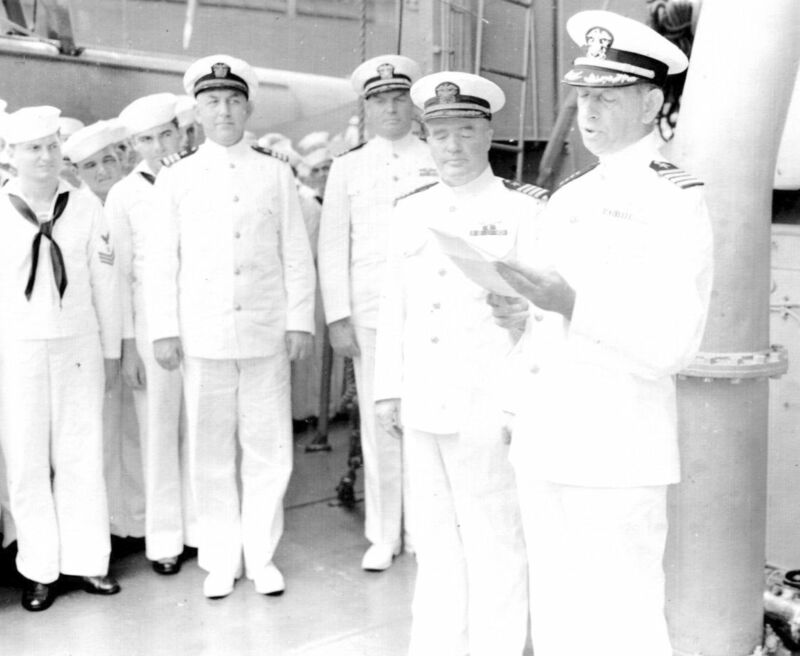 Change of Command; from CAPT Sowell to CAPT Chambers, which dates this photo at 13 July 1942. The officers are (from left to right) CDR Behrem, CDR Elliot, CAPT Sowell, CAPT Chambers. 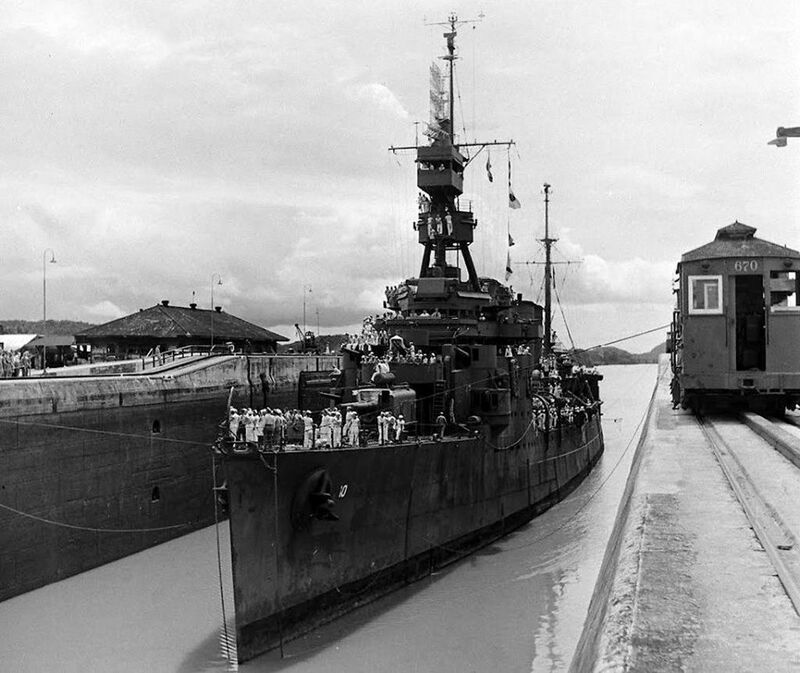 Starboard side view taken in Panama Bay, 21 November 1942. 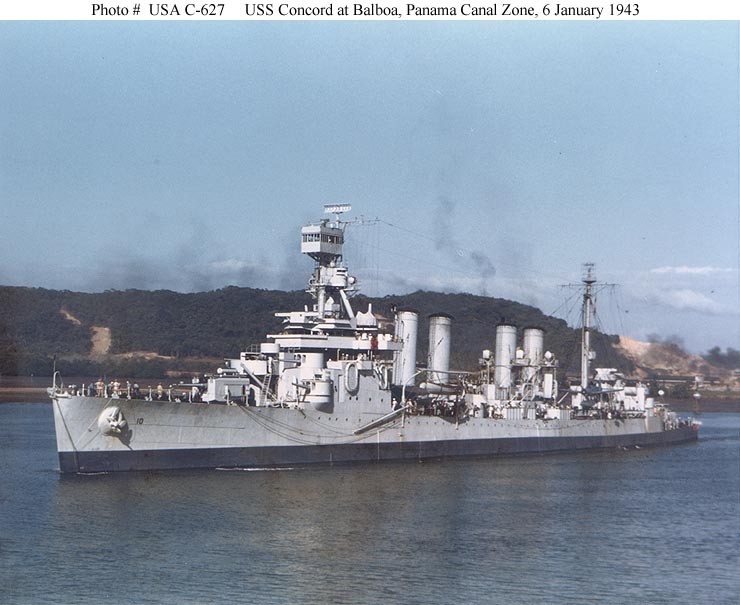 USS Concord (CL 10) Off Balboa, Panama Canal Zone, 6 January 1943. Photograph from the Army Signal Corps Collection in the U.S. National Archives #USA C-627. 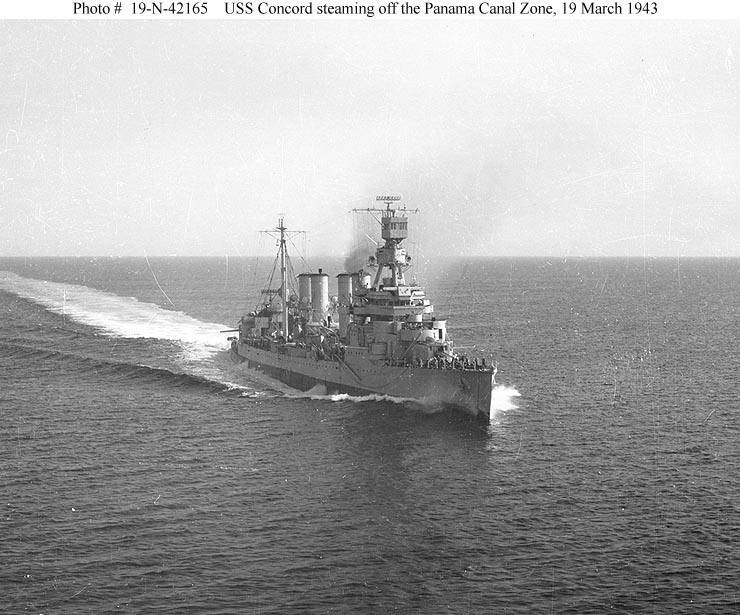 USS Concord (CL 10) Steaming off the Panama Canal Zone, 19 March 1943. 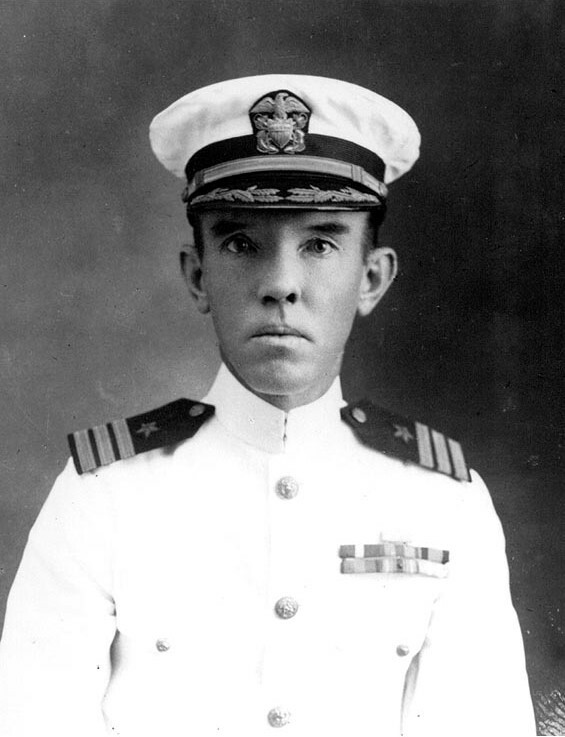 Photograph from the Bureau of Ships Collection in the U.S. National Archives 19-N-42165. 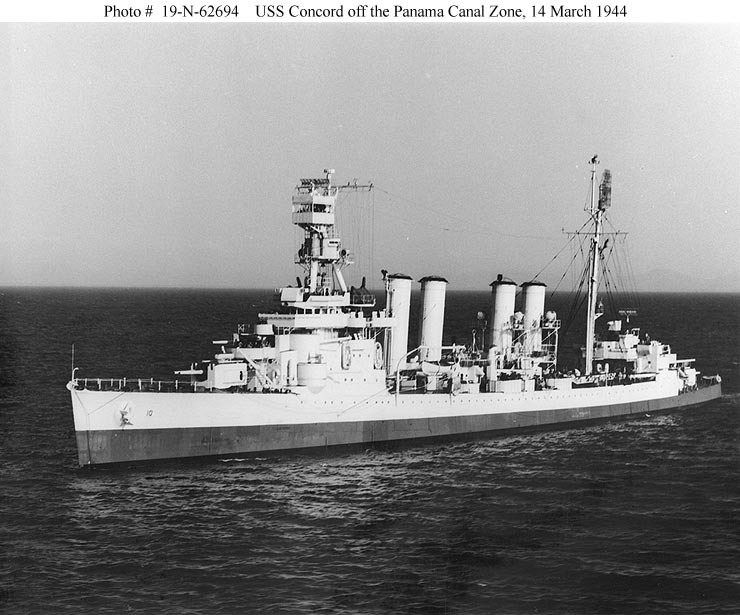 USS Concord (CL 10) Underway off the Panama Canal Zone, 19 March 1943. Official U.S. Navy Photograph, from the collections of the Naval Historical Center #NH 61552. 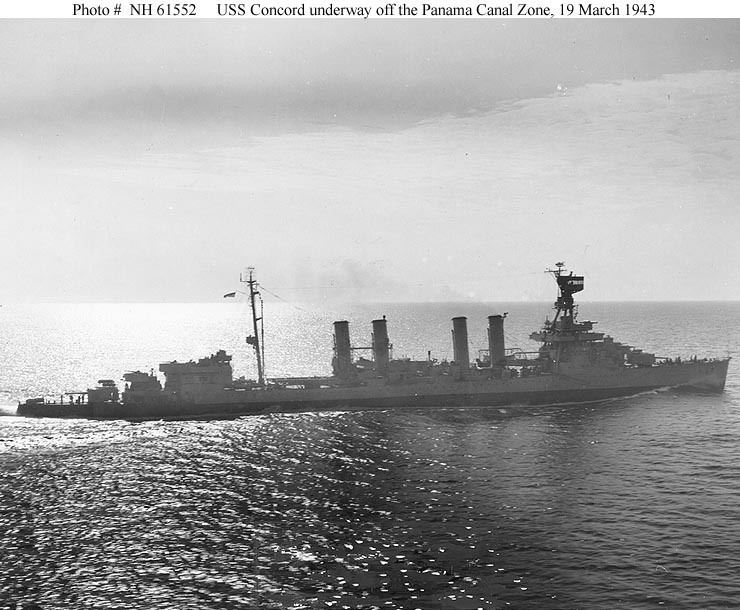 USS Concord (CL 10) Off the Panama Canal Zone, 14 March 1944. 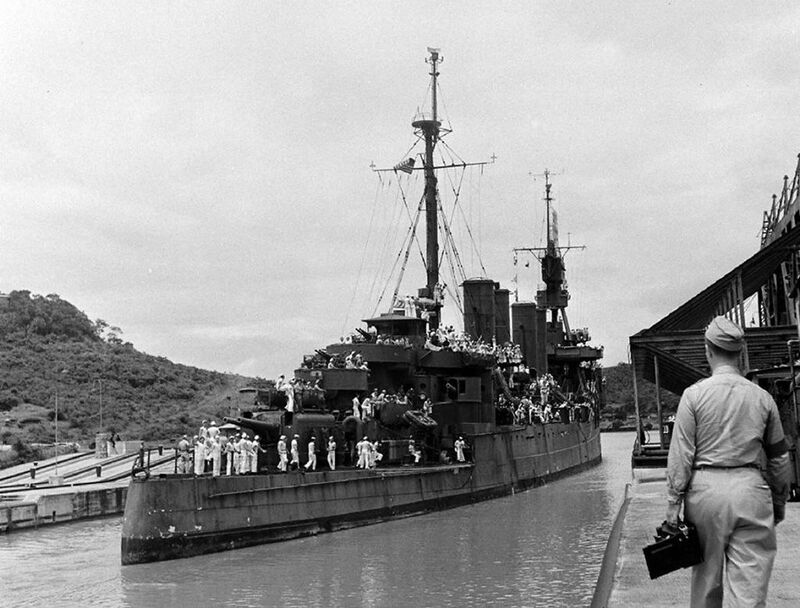 Photograph from the Bureau of Ships Collection in the U.S. National Archives #19-N-62694. 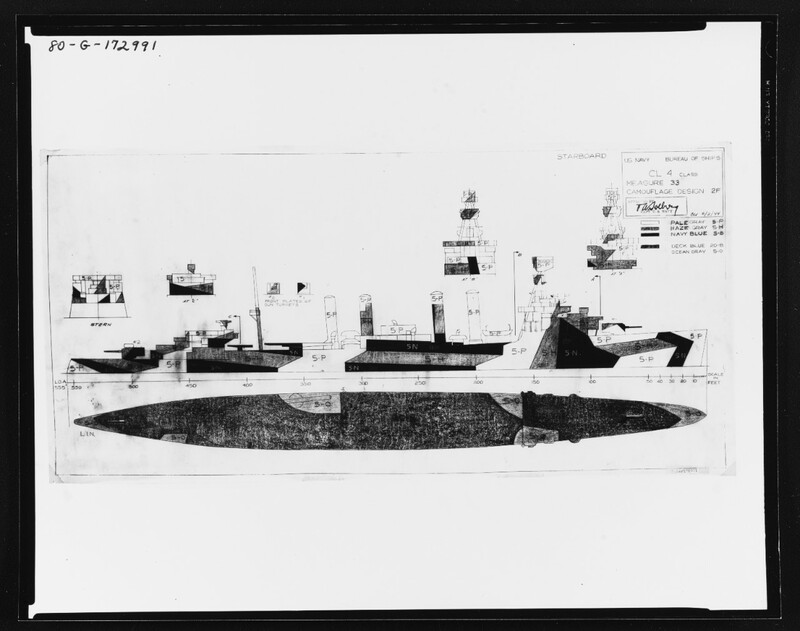 Drawing prepared by the Bureau of Ships for a camouflage scheme intended for light cruisers of the CL-4 (Omaha) class. This plan, approved by Captain Torvald A. Solberg, USN, is dated 3 June 1944. It shows the ship's port side. 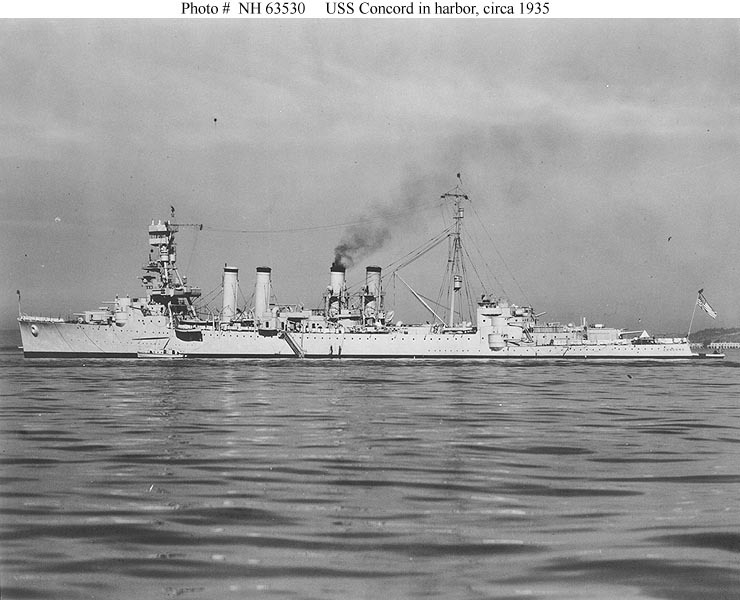 USS Concord (CL 10) and USS Trenton (CL 11) were painted in this scheme, though the colors used for the latter appear to have been the darker tones of Measure 32. 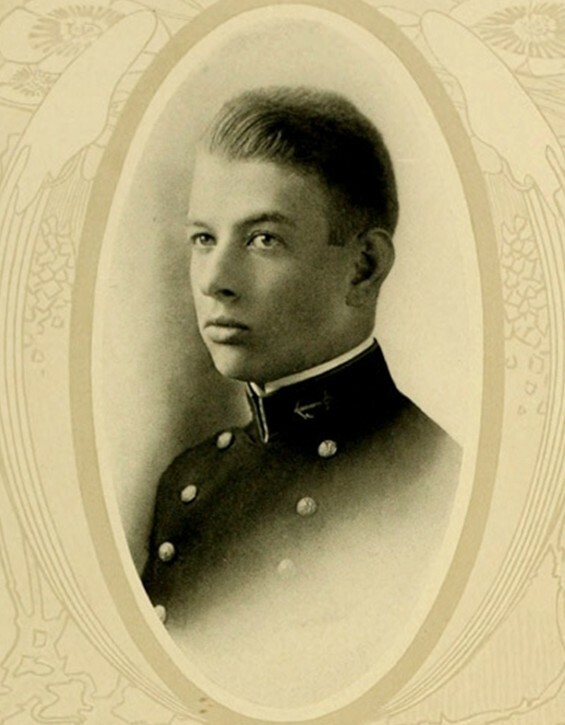 Official U.S. Navy Photograph #80-G-172992, now in the collections of the National Archives. Drawing prepared by the Bureau of Ships for a camouflage scheme intended for light cruisers of the CL-4 (Omaha) class. This plan, approved by Captain Torvald A. Solberg, USN, is dated 3 June 1944. 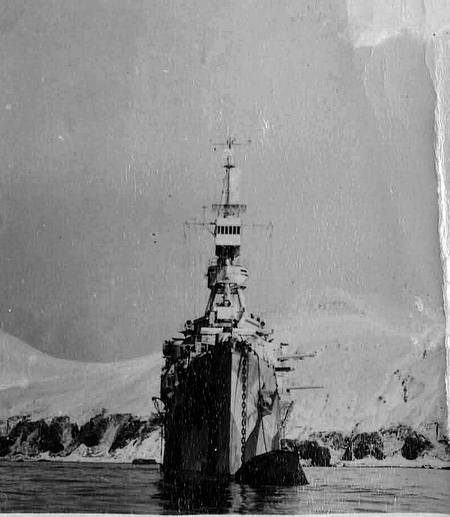 It shows the ship's starboard side, superstructure ends and exposed decks. 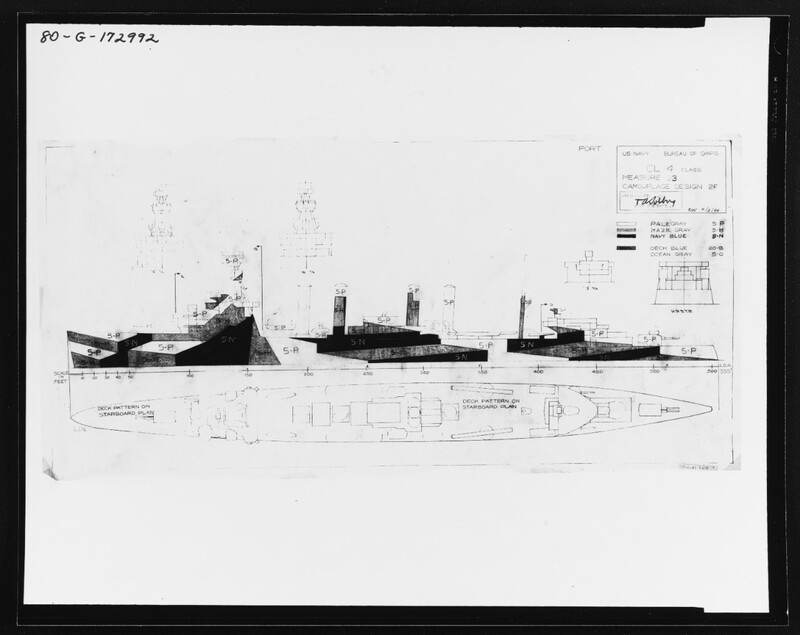 USS Concord (CL 10) and USS Trenton (CL 11) were painted in this scheme, though the colors used for the latter appear to have been the darker tones of Measure 32. 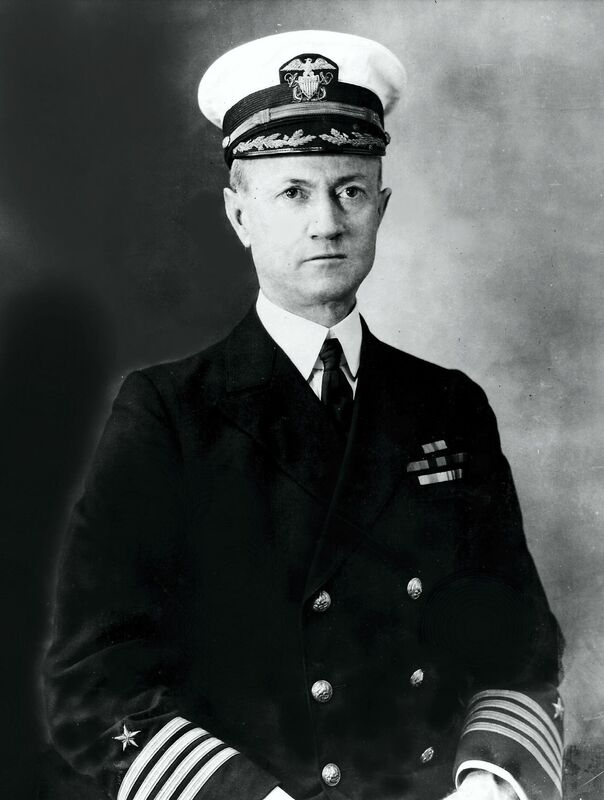 Official U.S. Navy Photograph #80-G-172991, now in the collections of the National Archives. 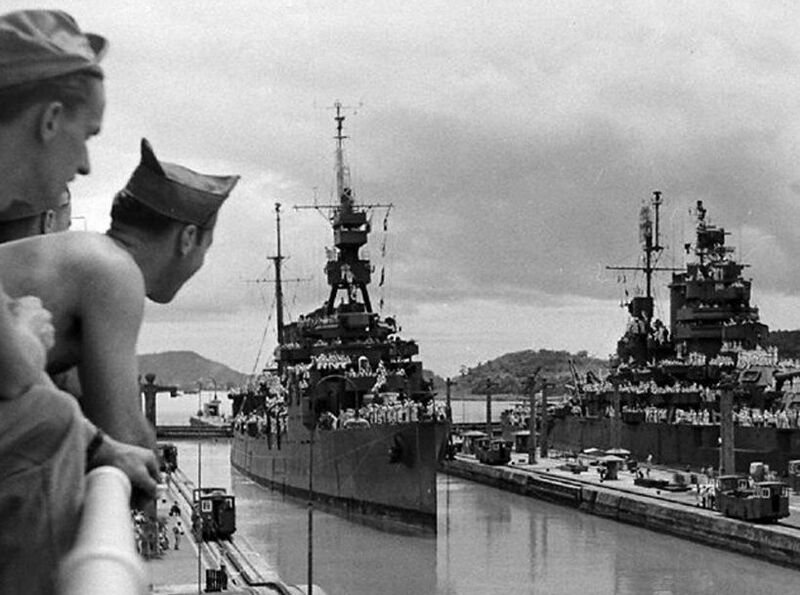 USS Concord (CL 10) at an unidentified location and on an unidentified date. Concord is wearing camouflage 33/2f using the colors navy blue (5-N), haze gray (5-H) and pale gray (5-P). United States National Archives, Photo #19-LCM-CL10-1, courtesy of C. Lee Johnson, (usndazzle.com). 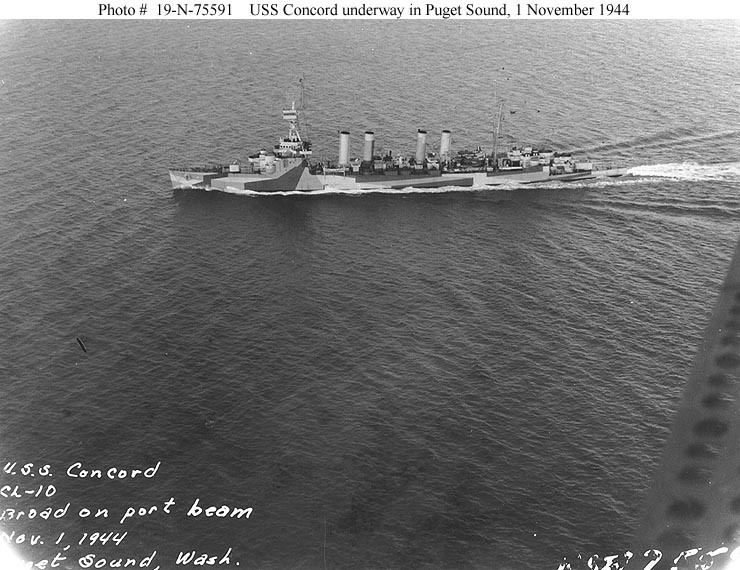 USS Concord (CL 10) Underway in Puget Sound, Washington, 1 November 1944. Her camouflage is Measure 33, Design 2f. 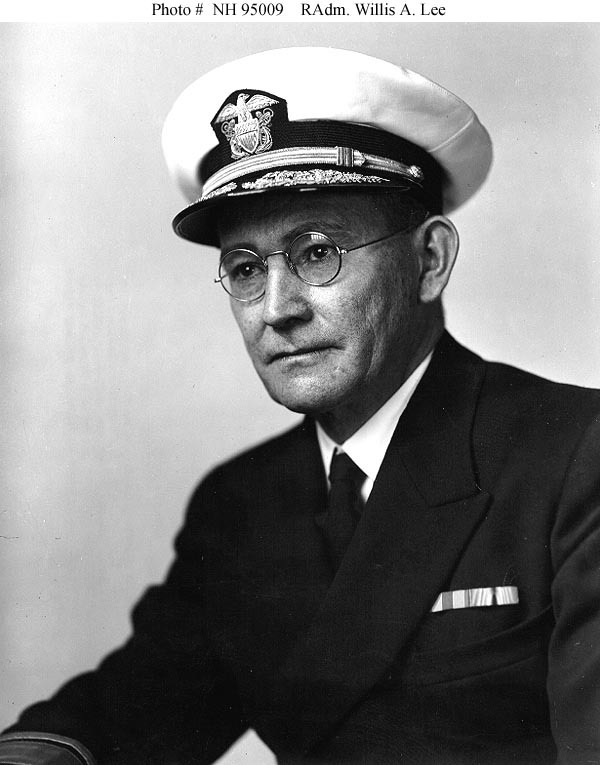 Photograph from the Bureau of Ships Collection in the U.S. National Archives #19-N-75591. 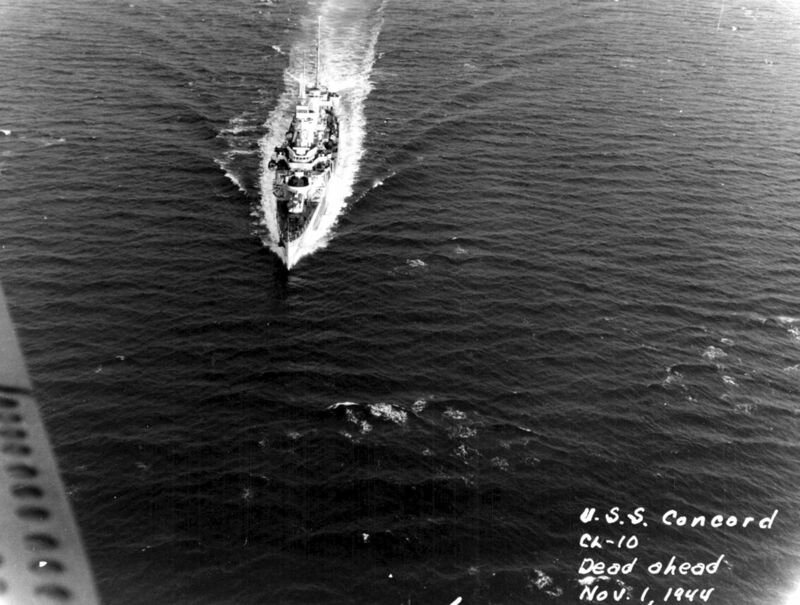 Bows on aerial view of USS Concord (CL 10) underway in Puget Sound, Washington, 1 November 1944. 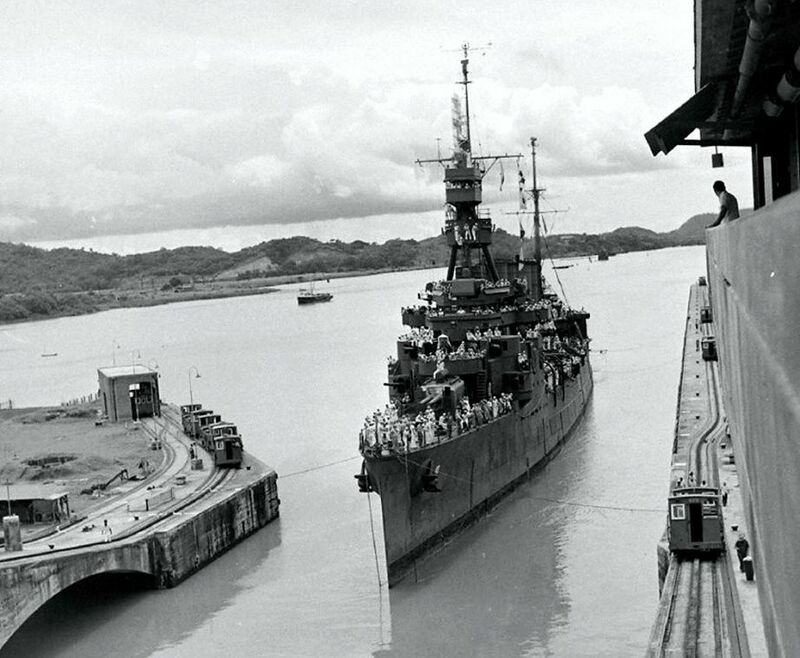 USS Concord entering the Miraflores Locks, Panama Canal on 8 October 1945, heading for the East coast and home. The force arrived as TF 11 and departed to East Coast ports on October 12th as TF62. Thomas McAvoy, Life Magazine, used for educational and non-commercial purpose. 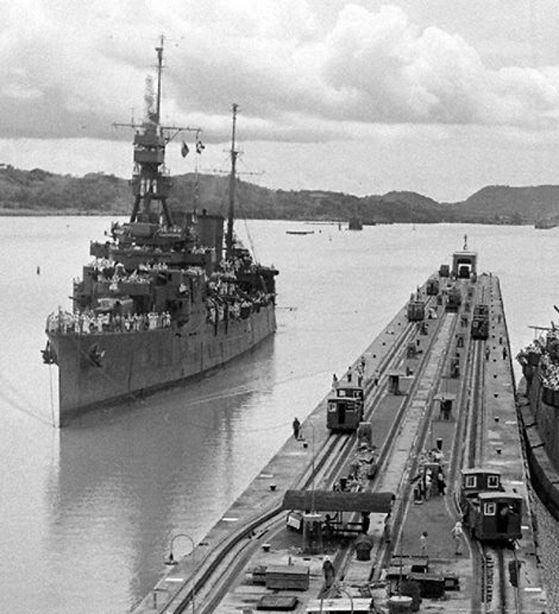 USS Concord leaving the Miraflores Locks, Panama Canal on 8 October 1945, heading for the East coast and home. The force arrived as TF 11 and departed to East Coast ports on October 12th as TF62. USS Concord across Pier 1, South Boston Naval Annex, and is open for public visiting on 27 October 1945. 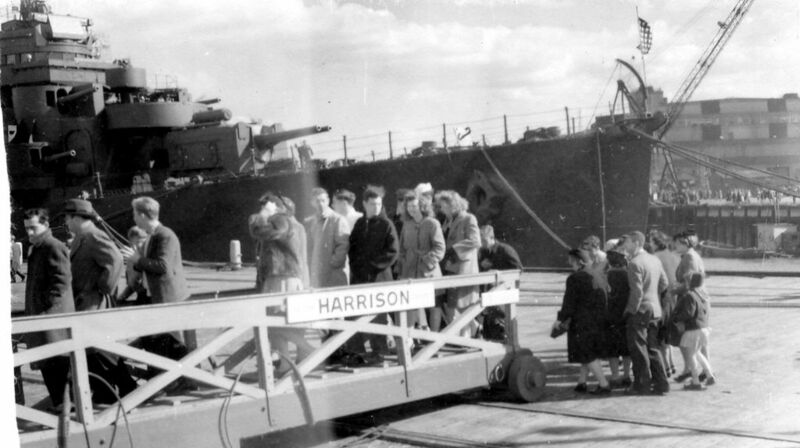 She frames a scene of the public welcoming the crews of Concord, Richmond (CL 9), USS Harrison (DD 573), and Rodgers (DD 876) from the other side of the world. 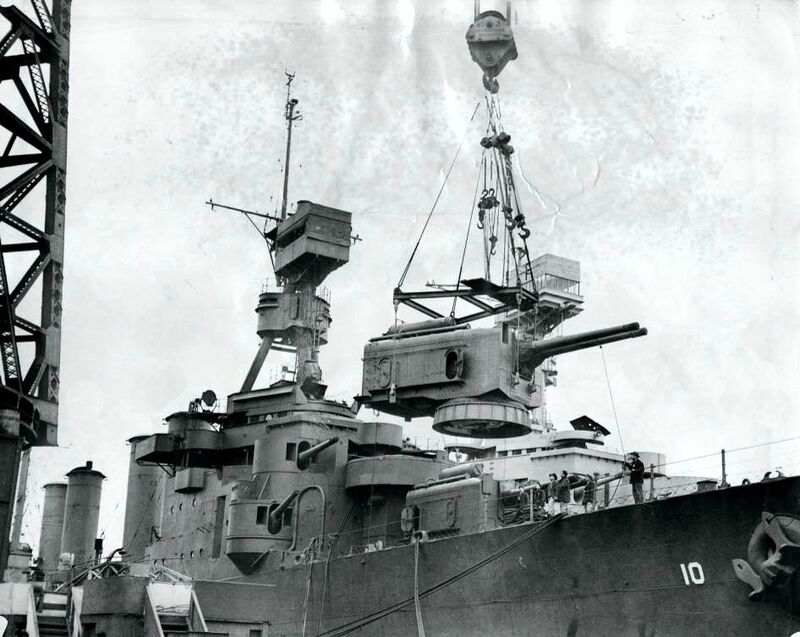 The original caption for this photo was "A crane is removing a twin 6-inch gun turret of the ex-USS Concord (CL 10) on 11 January 1946. This gun mount is credited with the firing of the last salvo in WW2 against the Japanese. 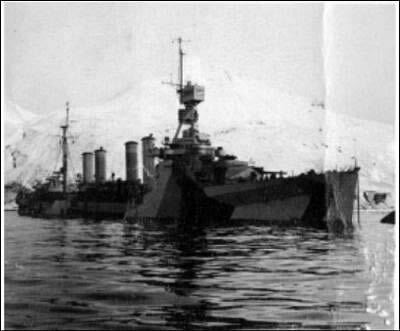 The ship, on 15 August 1945, was part of Task Force 92 and was bombarding shipping and shore targets on the Japanese Kuril Islands. 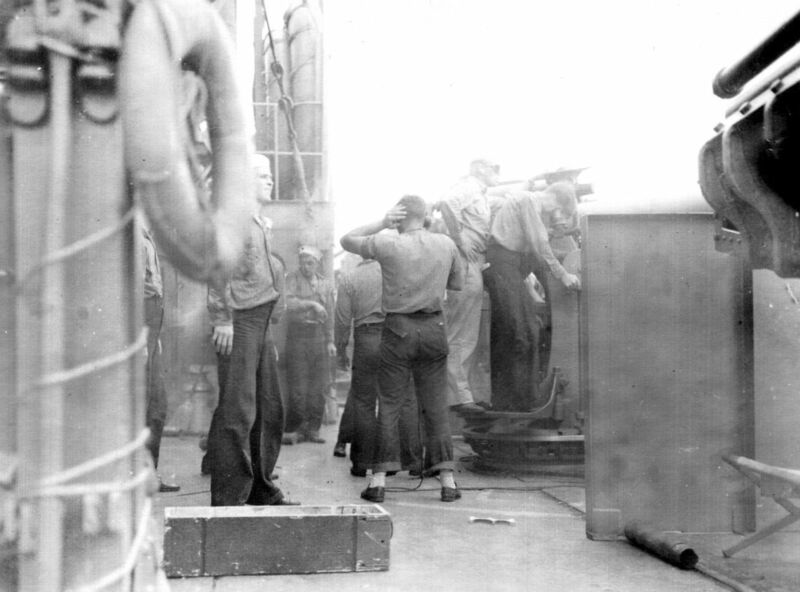 The previous shot had misfired just before the cease fire was announced, but the ship received special permission to fire one more shot, rather than manually unloading the gun." but this appears to be incorrect. 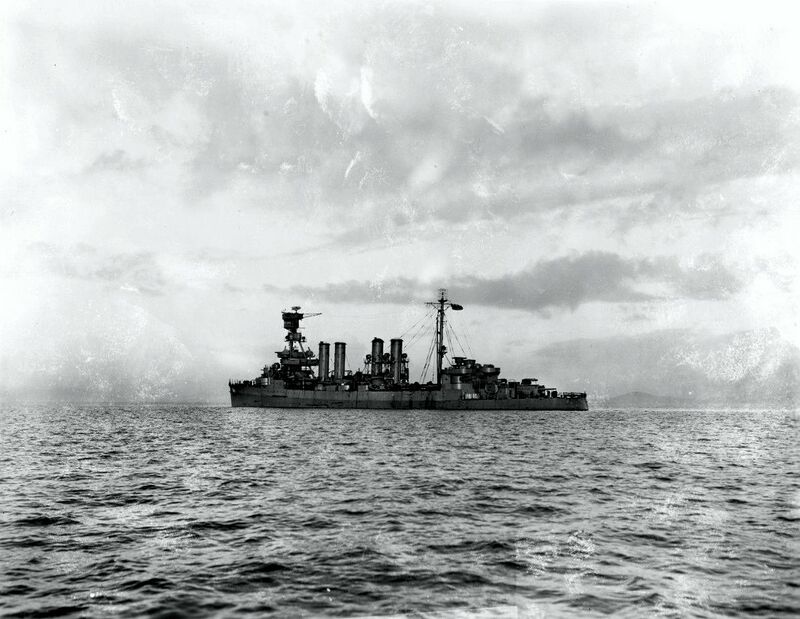 It appears that the turret in the air has been lifted from the Omaha Class cruiser outboard of the Concord. Note the person with the tagline attached to the gun barrel. This is being used to control the swing of the turret as it is lifted aross the Concord. 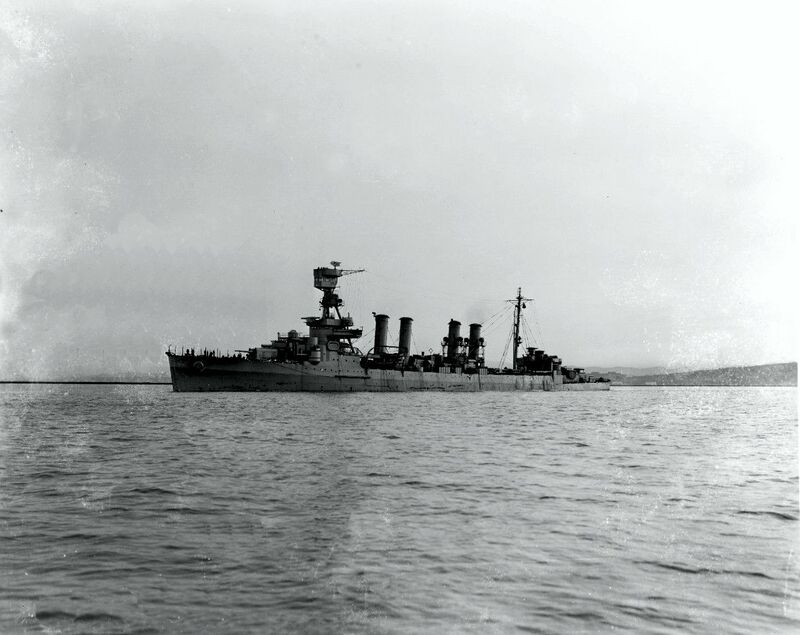 The aft turret would not have been lifted the length of the ship to it's current position in the photo.